Subduction of the ancestral Pacific plate beneath the North American plate was probably coincident with the break up of Pangea due to sea floor spreading which began in the Early Triassic (Deitz and Holden, 1970). Magma which erupted as pillow lavas was produced from partial fusion of the subducting oceanic plate (Gastil, 1975). The pillow lavas are not a part of the ancestral Pacific plate because interpillow fossils are Late Triassic in age. The magma continued to erupt, eventually building up a volcanic pile which formed a barrier that prevented the inflow of nonvolcanic terrigenous material into the basin. Explosive volcanic activity produced an abundance of volcanic ash. The explosive activity may have been caused by the seeping of seawater into volcanic fissures. Much of the ash fell directly into the basin and eventually lithified into green tuffaceous chert. Some of the ash dissolved in seawater, raised the silica content, and allowed epidemic reproduction and growth of radiolarians. Radiolarian tests are common in tuffaceous chert but are especially abundant in red, radiolarian chert, which was deposited during the radiolarian blooms. The volcanic pile formed a series of islands that were stable enough to allow development of a shallow water, fossiliferous carbonate-rock complex. Muddy carbonate sediment washed into the basin from the carbonate complex during storms and tests of siliceous plankton and hemipelagic pelecypods like Monotis sp. fell to the basin floor. Volcanic activity continued and turfaceous debris and unconsolidated carbonate mud were periodically washed into the basin and more or less mixed. Lithified bioclastic limestone from the carbonate complex became dislodged, mixed with epiclastic and pyroclastic volcanic debris, and slid into the basin. This accumulation of carbonate mud, volcanic detritus and limestone blocks, provided the sediment that formed the limestone member. Volcanic and carbonate sediments accumulating in shallow water on the margins of volcanic islands were dislodged during earthquakes resulting from volcanic eruptions. The displaced rock and sediment rumbled into the basin as blocky slide masses that carved into sea floor beds of the limestone member. The accumulations of blocky, shallow marine, bioclastic debris and subordinate amounts of carbonate-free epiclastic and pyroclastic debris formed the breccia member. Epiclastic and pyroclastic material continued to wash into the basin, but not in large enough quantities to mask most pelagic sedimentation. Some of the thin beds of sandstone and tuff that accumulated were reworked by submarine currents as evidenced by micro-graded beds and low angle cross-beds. Eruptions of volcanic ash were less common but they did foster minor radiolarian blooms. Carbonate mud from the adjacent shallow marine area and minor amounts of carbonate microfossils provided the calcium carbonate which eventually formed the calcite cement. These volcanic and carbonate accumulations make up the lower and middle parts of the sandstone member. Volcanic activity increased and massive conglomeratic sandstones and conglomerates accumulated so rapidly that almost all pelagic sedimentation was masked and reworking of the material by submarine currents was only minor. Considerable soft sediment slumping indicates the sediment was piled up into slopes. These accumulations formed the upper part of the sandstone member. Faults and fractures formed during burial were intruded by dikes and sills. 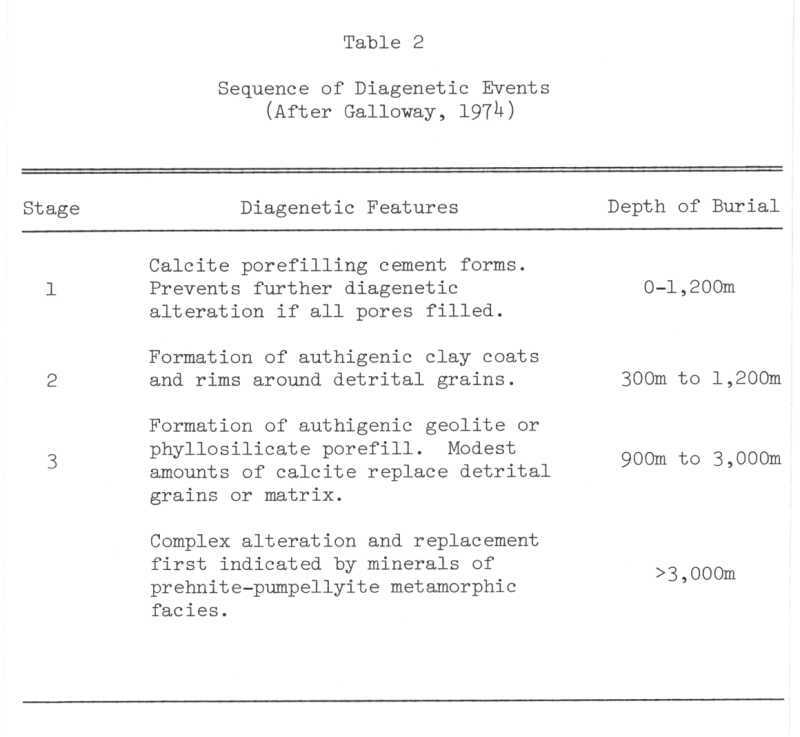 Upon further burial, the sandstones underwent stages of diagenesis similar to those described by Galloway (1974) in sandstones from the northeast Pacific (Table 2). In general, rocks of the San Hipolito Formation which contain high percentages of modal calcite contain low percentages of authigenic phyllosilicates and zeolites. These sandstones and sandy limestones were probably completely cemented during Stage 1 diagenesis (Table 2). Remaining sandstones have diagenetic features indicative of Stage 2 and Stage 3 diagenesis. Etching and replacement of detrital grains and matrix is modest in most rocks but is more advanced in rocks with higher modal percentages of calcite. Minerals formed at greater temperatures and pressures than those that are produced during Stage 3 diagenesis are not present in rocks of the San Hipolito Formation. Compressive tectonic forces during the Late Pliocene, or somewhat later, thrust the San Hipolito Formation over the Valle Formation at Punta San Hipolito (Mina, 1957). Deformation southwest of the San Hipolito Fault continued through the Quaternary, causing marine terraces overlying the San Hipolito Formation to be raised to higher elevations than the same terraces overlying the Valle Formation further inland to the northeast.